Supplementation is a process that has been used for decades, but the business of supplementation is bigger than ever. The news is overflowing with stories about athletes using supplements to enhance their performance and they are becoming widely used to improve mood, to combat sleep disorders and so much more. For our purposes, we’ll be focusing on dietary supplements. A dietary supplement is intended to provide nutrients that may be lacking in sufficient amounts in your body because your diet may not be adequately balanced. These supplements are found in the form of vitamins, minerals, fiber, fatty acids, or amino acids- the macro and micronutrients our body needs for survival. These products may be beneficial to someone who is deficient in a certain nutrient because of a certain health condition, diet restrictions or because certain foods have been eliminated or neglected in their daily intake. However, there is risk for overuse when a supplement is taken regularly and not needed. When does supplementation become a risk for my health? Dietary supplements may not always be necessary if you’re eating a well-balanced diet and acquiring all the nutrients your body needs. Consuming supplements when a nutrient is not deficient in the body is when health risks can become a concern. In fact, some supplements can actually increase the risk for other serious diseases or illnesses because excess nutrient gets stored in the body and the buildup can have negative effects. For example, high doses of Vitamin E can increase risk of prostate cancer in men and high doses of calcium can increase risk for heart attacks. 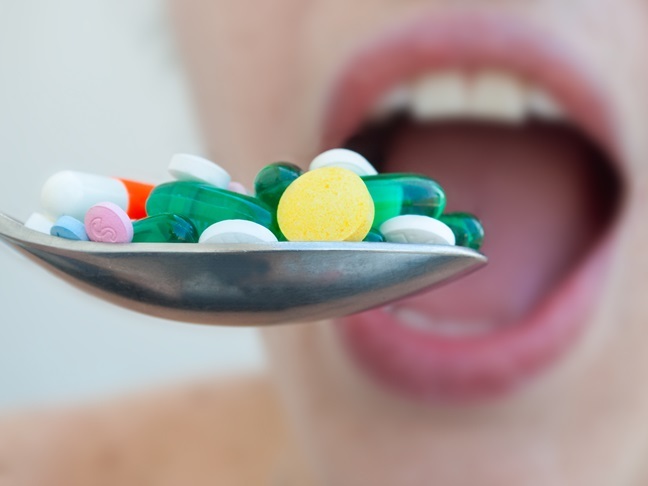 In addition to risk of vitamin or mineral overdose in the body, there are several medications that react negatively with supplements in the body. One of the most common cases of this effect is related to Coumadin, a blood thinner. This medication reacts especially with Vitamin K in the body, so supplements of this vitamin while on this medication would be harmful. Vitamins and minerals that tend to lack in the average person’s diet are also increasingly being added to foods, like cereals and breads through the process of enrichment or fortification. So, if you’re eating these types of foods, you may actually be consuming more of these nutrients than you think and supplementation may be giving you more of certain nutrients than you need. While there are negatives to taking supplements when we don’t need them, here’s another point to consider in order to make an educated decision. Our soil has become so depleted that even if you are eating what would be considered a healthy diet, it’s unlikely you’re getting the nutrients you need on a daily basis without the help of some additional supplementation from a quality source. And, here’s yet another factor to keep in mind. Even if we are taking supplements regularly, the quality of the supplement and the absorption may be poor. When this is the case, we create a greater burden on the body than the benefit the supplement is designed to provide. It’s essential that you analyze your diet and consult with a qualified health care practitioner before you add supplements to your daily routine. We’ll talk more about this in the part 2 of this post coming soon. Until then, eating a nutrient dense diet filled with locally grown, real, whole foods is a great place to start!